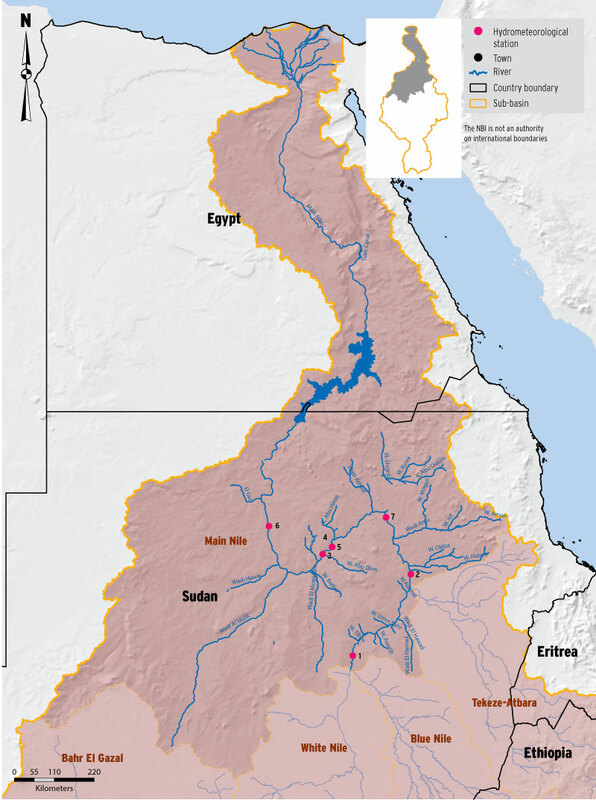 The Main Nile Sub-basin: this sub-basin includes parts of Sudan and Egypt and includes, the Nile Delta, which is one of the most intensively cultivated lands in the world since millennia. 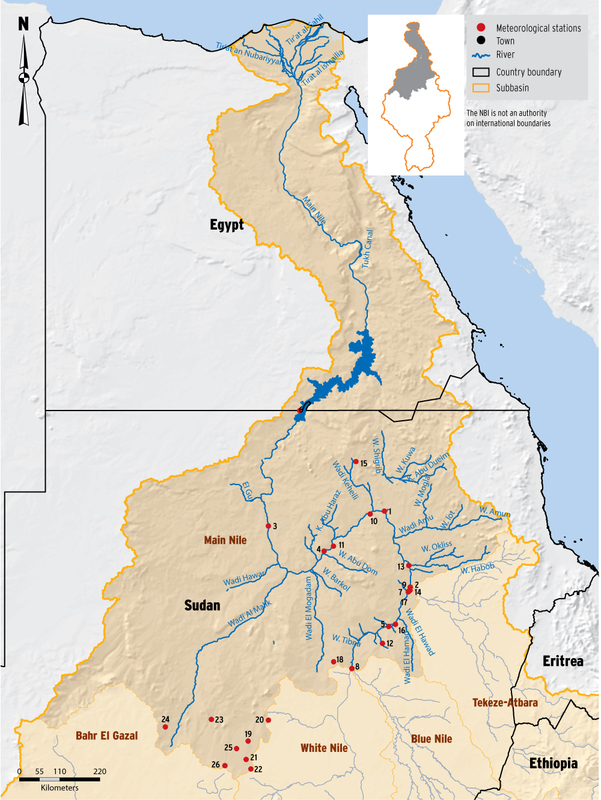 The Main Nile sub-basin is the part of the Nile Basin, which receives least amount of rainfall. However, on the other hand, this is the part of Nile Basin which exhibits most of the consumptive water use. It accounts for approximately 80 percent of the total estimated water abstraction from the Nile system for irrigation. In addition, evaporation from the High Aswan and Merowe dams account for about 13 – 14 x 109m3 of water per year that is approximately 78 percent of all the evaporation from man-made reservoirs basin-wide. With increasing water demands under increased climatic variability, it is crucial to strengthen monitoring of water use patterns and evapo-transpiration in this part of the Nile Basin. There are 26 meteorological stations in Sudan within the Main Nile sub-basin. The distribution of the stations is shown in the map below. 11 stations are reported to measure the full range of meteorological parameters and the rest 7 measure daily rainfall totals only. There are 8 hydrometric stations in the sub-basin in Sudan. The number of stations in Egypt, i.e. downstream of the High Aswan Dam is not included in the survey results. The oldest station, Main Nile at Thamaniat was established in 1912 and, hence, has over 100 years of records. The ultimate downstream station before the Nile enters the High Aswan Dam is at Dongola, which was established in 1923. Three stations, namely, Tamaniat, Dongola, measure sediment loads in addition to water level and discharge. A new station has been established recently at Merowe dam (commissioned in 2009). Main issues that require strengthened monitoring in this sub-basin are water quality deterioration, sediment load and sand encroachment and water loss through river bank overflows. Dongola, Tamaniat and Hassanab stations are included in the Nile Basin Regional Hydromet Network with main strengthening required in sediment and water quality monitoring.